The beauty of making your own ice cream is that you can make your own flavor combinations. Raspberry Swirl Ice Cream is one great example; where you take homemade vanilla ice cream, that has a nice sweet vanilla flavor and creamy smooth texture, and layer it with a tart and tangy flavored raspberry sauce. When you place a frozen scoop in your bowl, you will see lovely swirls of ruby red sauce running through the vanilla ice cream. This ice cream has a custard base. The four main ingredients in a custard are cream, sugar, eggs, and flavoring. It is important to get the right mix of these ingredients so the ice cream will have that smooth texture and rich flavor we so desire. The amount of cream used and its butterfat content gives ice cream its rich and creamy taste. However, too much fat can cause a heavy product and smalls lumps of "butter" can form which produces that grainy texture which is often found in homemade ice creams. Sugar gives the ice cream its smoothness but too much sugar will prevent the ice cream from freezing. Eggs are necessary for smoothness and also gives the ice cream its nice color. Making the custard the night before so it has time to chill sufficiently allows the ice cream to freeze before the churn gets too warm and gives the ice cream its smooth texture. The custard should only fill your ice cream machine about half to two thirds full. This is so the custard has enough room to expand while it freezes so you end up with an ice cream with a light texture and no graininess. Once the vanilla ice cream is made, it is layered in your container with the raspberry sauce. Place about one third of the ice cream in the bottom of a container and then pour in about half the raspberry sauce. Next, place another third of the ice cream on top of the raspberry sauce. Top with the remaining sauce and then the rest of the ice cream. Cover and place in the freezer for several hours or until firm. As this recipe only uses egg yolks, there is always the question of what to do with the leftover egg whites. Meringues (Meringue Cookies, Meringue Hearts, Meringue Mushrooms, Pavlova) are always a good way to use egg whites as is the Chocolate Angel Food Cake. 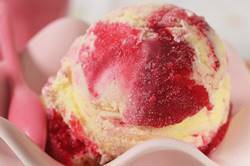 Raspberry Swirl Ice Cream: In a small saucepan, over medium-high heat, bring the half-and-half and the vanilla bean (if using) to the scalding point (the milk begins to foam up). Remove from heat, take out the vanilla bean and scrape the seeds from the bean with the back of a knife, and mix the seeds back into the half-and-half. Meanwhile in a stainless steel bowl beat the egg yolks and sugar until light and fluffy (about two minutes). You can do this with a wire whisk or I like to use a hand mixer. Gradually pour the scalding half-and-half into the whipped egg yolk mixture, making sure you keep whisking constantly so the eggs don't curdle. If any lumps do form, strain the mixture first before heating. Place the bowl over a saucepan of simmering water and, stirring constantly with a wooden spoon, cook until the custard thickens enough that it coats the back of a spoon (170 degrees F) (77 degrees C). The term 'coat a spoon' is a technique used mainly as a way to test when an egg-based custard or sauce is done. A spoon, usually wooden, is placed in the custard and, when the spoon is raised, the film of custard on the back of the spoon will stay in place even when you draw a line with your finger through the middle of the custard. Immediately remove the custard from the heat and continue to stir the custard for a few minutes so it does not overcook. At this point stir in the vanilla extract, if using. Cover and let cool to room temperature and then refrigerate the custard until it is completely cold (several hours but preferably overnight). Transfer the cold custard to the chilled container of your ice cream machine and process according to the manufacturer's instructions. 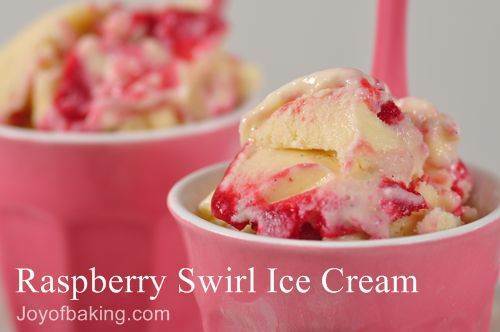 Once the ice cream is made, to create the marbleized or swirled pattern, place about one third of the ice cream in the bottom of a container and then pour about one half of the raspberry sauce on top of it. Top the sauce with another one third of ice cream and then the rest of the raspberry sauce. End with the remaining ice cream. Cover and place in the freezer for several hours or until firm. If the ice cream becomes too hard place in the refrigerator for about 30 minutes before serving so it can soften. Makes about 3 cups. Preparation time 45 minutes. Note: Half and Half cream is a mixture of cream and whole milk and contains 10 - 12% butterfat. Andrews, Tamra, Nectar and Ambrosia: An Encyclopedia of Food in World Mythology. Santa Barbara: ABC-CLIO, Inc., 2000. Dickson, Paul. The Great American Ice Cream Book. New York: Galahad Books, 1972. Liddell, Caroline and Weir, Robin. Frozen Desserts. New York: St. Martin's Griffin: 1995. Visser, Margaret. Much Depends on Dinner. New York: Grove Press, 1986.